Welcome to Blacky's Guide Service! Recognized year in and year out as one of the top performing boats on the river Troy Black has gained a reputation of consistently putting fish to the boat for his clients. With over 20 years of experience fishing for salmon, steelhead, sturgeon, and trout Troy provides his clients with a truly fantastic fishing experience. His ability to consistently put his clients on fish is what sets him apart from the fleet. 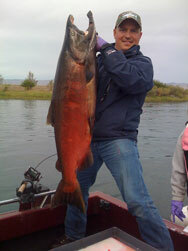 This is just one of the reasons Troy is one of the most sought after fishing guides in the Northwest. Anglers of all skill levels from novice "new beginners" to the experts are welcome. Whether you are a single fisherman or a large corporate group we can accommodate your fishing needs. 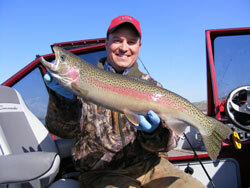 I will provide you with a top notch, friendly, and educational fishing experience. My goal is to make your fishing dreams a reality. Let's go fishing! Copyright © 2017 Blacky's Guide Service. All Rights Reserved.